Frank YangSparklehorse were never an especially commercially successful band during their lifetime, their heartbroken transistor radio cosmic country finding only a cult audience, but a lot of that cult audience were other artists. And so almost four years after Mark Linkous took his own life, the Box Of Stars organization, which seeks to raise awareness of mental health issues through music, has gathered together an impressive roster of those fans for Last Box Of Sparklers: A Tribute To Mark Linkous. 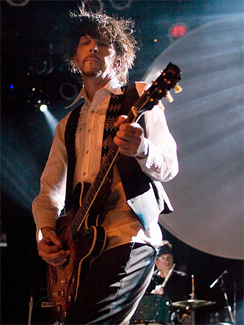 Amongst the contributors you’ll find Sparklehorse forebears, contemporaries, and followers including The Flaming Lips, Dinosaur Jr, Cowboy Junkies, Phantogram, and The Joy Formidable. Financing for the release is currently being sourced through Indiegogo and with nine days to go, they’re 40% of the way to their $50,000 goal. It would be a shame on so many levels if this project didn’t happen so if you were a fan of Sparklehorse – or are a fan of any of the contributing artists and would like to be introduced to the sad and beautiful world of Sparklehorse – see about contributing. Pitchfork has more details on the project and a stream of Mercury Rev’s track. The National have made their contribution to the new The Hunger Games: Catching Fire soundtrack – due out November 19 – available to stream and guitarist Aaron Dessner gives NME some insight into their plans for their next album. Unofficial ambassador of Arizona to the world – never mind that Walter White fellow – Howe Gelb has made a date at The Drake Underground on December 7 to play songs from his new solo record The Coincidentalist, his first visit since bringing the ‘Sno Angel Like You gospel project to Lee’s Palace in December 2006. Tickets for that will be $17.50. Pitchfork and Rolling Stone talk to Stephen Malkmus about his new album with The Jicks, entitled Wig Out at Jagbags and due in January 7; details at Matablog, lyric video for a new song below. Sing along! The whole of Warpaint’s set at the Pitchfork Paris festival earlier this month is available to watch online; I would expect some tracks from their new album Warpaint, out January 21, are included in the set. Though just here last last month, San Francisco’s Weekend are coming back to town and bringing Philadelphia’s unbelievably loud Nothing – themselves just here in August – for a show at The Garrison on January 21; tickets are $10.50 in advance. Le Tigre alumnus JD Samson & MEN are touring behind their new record Labor and will be at The Garrison on January 26. Noisey has an interview with Samson. Rolling Stone has premiered a stream of the new song by Hospitality, taken from their sophomore album Trouble, coming out January 27. Austin’s White Denim have announced Winter dates behind their new, Jeff Tweedy-produced album Corsicana Lemonade; dates and a stream of the album can be had at Exclaim, and they include a March 3 date at The Horseshoe, tickets $15.50. The Irish Examiner has an interview with the band and NPR a video session. Billboard talks to Patterson Hood of Drive-By Truckers about their new album, recorded in a fortnight and set for release in March of the new year. We Are Scientists have slated a Spring tour behind their new EP Business Casual – which includes a cover of Berlin’s love theme from Top Gun which itself has a video – and they’ll be at Lee’s Palace on April 22. Innocent Words has an interview with Tanya Donelly. Superchunk have made the latest edition of their Clambake live album series – a 1996 vintage show in Melbourne – available to stream for free. NYC Taper is sharing a record of Built To Spill’s visit to Irving Plaza in New York last week. PopMatters, The Georgia Straight, and San Francisco Examiner talk to Cameron Mesirow of Glasser. The Alternate Side has a session with The Dismemberment Plan. eMusic, Paste, and Filter have interviews with Midlake, who also offer instructions on how to make an old-fashioned. Noisey talks to Josh Tillman of Father John Misty. Spin and The Fly talk to Wayne Coyne of The Flaming Lips. The 405 interviews The Men. Rolling Stone has a eulogy for Lou Reed by his wife Laurie Anderson, as well as video of his final interview. Frank YangWait, what happened to Toronto Urban Roots Fest day two? Exhaustion and a backlog of Hannibal happened, but I was mostly recharged and ready to go for the full-day programmes down at Fort York over this past weekend; Saturday, in particular, was not to be missed as it would be the day that the “R” in “TURF” would stop standing for “roots” and most definitely stand for “rock”. Los Angeles’ Dawes straddled those two solitudes quite nicely, mind, with their sweet Laurel Canyon-inspired harmonies and songwriting and edge-of-jam-band – yet always totally tasteful – guitar solos courtesy of frontman Taylor Goldsmith; it was an ideal balance of crunchy and smooth, if you’re given to peanut butter analogies. But as solid a frontman as Taylor was, the band’s secret weapon was his brother Griffin, who contributed astonishing backing vocals from behind the kit along with some killer drummer face for good measure. They didn’t draw the biggest mid-afternoon crowd – possibly because they had another headlining show slated for Lee’s Palace later that night – but when those who were there were called on to sing along in “When My Time Comes”, they sounded legion. Very impressive. The Minneapolis Star Tribune has an interview with Dawes. You could arguably file Dartmouth’s Matt Mays alongside Dawes in record stores where “roots-rock” is a distinct thing, but he definitely dwells far more toward the rock end of that spectrum – those who found Dawes a bit sedate or polite was probably delighted by the balls-out approach favoured by Mays and his crew. Though undoubtedly still shaken by the sudden passing of guitarist Jay Smith barely a month earlier, from a performance point of view they were firing on all cylinders with a stock of tunes tailor-made for playing loud in the Summer sun. Theirs was a set of dueling guitars and whipping sweaty hair, and I think my favourite part of their set was after a a particularly energetic number, Mays mouthed “how long?” to the stagehand and incredulously repeated, “Twenty-five minutes?! ?” – they were not pacing themselves, and the show was all the better for it. Though as I understand it, he’s a pretty big star in the UK now, I’d somehow managed to never hear Frank Turner & The Sleeping Souls before their set, and all I had to go on was that apparently he gets compared to Billy Bragg a lot. Which is cool, because I like Billy Bragg. As it turns out, that’s not the best reference point because Turner really doesn’t sound like Billy Bragg. Handsome and poshly-accented, his songs sound political but are far vaguer than anything Bragg has ever penned, favouring pub-friendly anthemicism to fiery activism and commentary; more Pogues than Clash. But while it’s unlikely to incite a revolution, that everyman approach makes for some rousing music and there’s no debating his ability to stir up a crowd. Energetic and charismatic, he was quick with the banter and expressing his appreciation for the city – he’s no stranger to Toronto stages – and curried some domestic favour with a sharp cover of The Weakerthans’ “A Plea From A Cat Named Virtue”; a canny move, as everyone loves a cat song. RTE has an interview with Turner. My relationship with Toronto’s own Lowest of The Low is a long one. Anyone who knew me in my late teens/early twenties – or read this post from 2007 knew that they were easily my favourite band going and hugely important to me, and so when they announced that after their 2000 reunion turned into a going concern, they were again hanging it up for good with a final hometown show that December, it stirred all kinds of memories and nostalgia and whatever, and I bid them farewell. Well, of course they didn’t actually split up, as some 2010 one-off shows turned into tours and more shows and though I probably wouldn’t have gone to them anyways, I felt that I needed to boycott them on principle. Happily, I’ve gotten over myself and allowed that the band is allowed to do whatever the hell they want, and thankfully was able to actually enjoy their TURF set rather than grumble about it. Interestingly, they were back down to a four-piece – founding bassist David Alexander remained absent, but utility player Lawrence Nichols was no longer in the fold – and while they did roll out some new songs, noting that they were going back into the studio to record a fourth album, it was the old tunes that made the day. I still know all the words to “Eternal Fatalist”, “Bleed A Little While Tonight”, and “Rosy & Grey” and probably will until the day I die – and even though Stephen Stanley’s guitar was nearly inaudible in the mix for the first half of the set, I was able to hum every solo as well. They weren’t that tight up there, certainly not compared to the full-time touring outfits sharing the bill with them, but were good enough for rock’n’roll and Hawkins is still a sharp and funny frontman. Not sure about that hair, though, Ron. 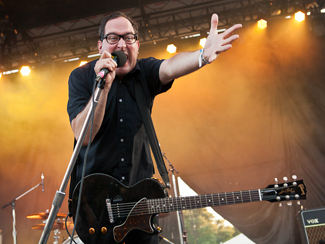 And then The Hold Steady. Because I’d seen them so so so many times in a three-year span, I didn’t realize that it had actually been over four years since I saw Craig Finn and the boys do their thing. The upside of this is that it made our reunion at TURF all that more joyous, though anything Hold Steady is bound to be joyous regardless. After a series of introductions – festival organizer intro-ed sportscaster Dave Hodge who intro-ed superfan Frank Turner who finally intro-ed the band before running down into the pit to rock out to the show – The Hold Steady took the stage to the biggest cheers of the day and put on a clinic about the power and celebratory spirit of rock’n’roll. Powering through a seventeen-song set that gave about equal time to all their records including the new one they’d be going into the studio to record this week, the band were in excellent form with Finn in extra-good spirits from seeing his Minnesota Twins shut out the hometown Blue Jays down the street earlier in the afternoon. Having missed the Heaven Is Whenever tour entirely, it was my first time seeing them without keyboardist Franz Nicolay, and while his keyboard flourishes and sartorial flair were missed, new guitarist Steve Selvidge endeared himself with some Thin Lizzy-esque lead lines with Tad Kubler. And even after it was done, it wasn’t as the roaring audience demanded that rarest of beasts – an encore from anyone but the last act of the night, they rip-roared through “Stay Positive”; Frank Turner leapt onstage to add vocals, but we all knew the “whoa-oh-oh”s. Exhausting and exhilarating. Speaking of rock… Drive-By Truckers haven’t been through town in a while – not since November 2011 behind their last full-length Go-Go Boots, what with both Patterson Hood and Mike Cooley working on solo projects and the departures of bassist Shona Tucker and guitarist John Neff, but the Truckers are back on the road and will be at The Phoenix on November 2 with Old 97’s, who themselves haven’t been to town since Spring 2011, along as support. Not sure if this means there’s new records on the way from either of them, but I get the feeling folks will be perfectly happy to hear the old stuff. NYC Taper has posted a recording of an Old 97s show in Brooklyn last week, if you want to hear what Rhett and the boys are sounding like these days. Exclaim has specifics on the new double-album from Quasi, who are marking their twentieth anniversary as a band with Mole City, out October 1. There’s a trailer and advance MP3 to inspect. Cincinnati CityBeat welcomes home native sons The National with a feature interview. NPR has a World Cafe session with Black Rebel Motorcycle Club, who also just rolled out a new video from Specter At The Feast. Daytrotter has posted a session with Saturday Looks Good To Me. Future Bible Heroes have released a new video from their latest album Partygoing, which will surely make up for the sting of knowing that their show at Lee’s Palace, originally set for later this month, has been canceled. But that happened ages ago, so you already knew that, right? Right. Titus Andronicus have rolled out a new album from last year’s Local Business and are already taking preorders for their fourth album, due for release next year. Under The Radar interviews Wayne Coyne of The Flaming Lips. Consequence Of Sound has compiled and impressive oral history of Big Star. Southern ShelterThere’s not really a lot to covering Bruce Springsteen. Whether you’re fronting a big band or are just a guy with a guitar – and maybe a harmonica – all you really need is the ability and conviction to sing it the way Bruce intended it; the song really does the rest. Given that criteria, Patterson Hood has got it – if you’ll excuse the pun – covered. The Drive-By Truckers frontman opened up for Sonic Youth at the 40 Watt Club in Athens, Georgia in December 2007 and for this set, opted to do a set comprised entirely of Bruce covers. And not just any old set of Springsteen tunes, but only ones taken from The Boss’ 1978 album Darkness On The Edge Of Town. Hood explained his affection for that particular Springsteen record in a piece for Aquarium Drunkard and the full set is available to hear and download at Southern Shelter. Springsteen is in town this coming Friday night, August 24, for a show at the Rogers Centre in support of his latest album Wrecking Ball. Drive-By Truckers’ last release was 2011’s Go-Go Boots, but Hood is releasing his third solo record in Heat Lightning Rumbles In The Distance on September 11. Charleston City Paper has an interview with Hood. Frank YangA little time off can be nice, but as much as I was enjoying the very unusual but welcome two-week break from show leading up to SXSW this week, it was also making me a bit antsy. Thank goodness for the Young Prisms in-store at the new Kensington Market location of Sonic Boom, in advance of their show that evening at The Drake. It would give me a quick, convenient way of scratching the live music itch and also let me pick up some LP sleeves. Everybody wins. I saw the San Francisco outfit last February opening up for The Radio Dept., and while their dream-pop tended more to the murkier side than I’d like, they were a charming crew and so young that they could have grown plenty in the elapsed time. After all, In Between – the follow-up to their 2011 debut Friends For Now – was already done and coming out in a few weeks; it seemed highly unlikely that they would still be the same band as they were a year ago. Turns out that was true in the literal sense – they were now a five-piece with the addition of guitarist/vocalist Ashley Thomas to the mix, and while her presence didn’t totally invert their sound, it made a difference. They still sounded very much like My Blood Valentine mixed with morphine – the opiate, not the band – being loud and fuzzy yet not especially aggressive, but the tunefulness that they previously seemed to prefer buried was now being allowed to surface. The second guitar was able to pick out melodies overtop of the churning bed of glider guitar and pounding rhythm section and when Thomas and lead vocalist Steph Hodapp harmonized as they did on new song, “Four Hours (Away)”, well it was clear that Young Prisms had a potent new instrument at their disposal. Based on a few songs, it’s hard to say too definitively how far Young Prisms have come – the new record isn’t out until March 27 – but it sounds as though they’re mixing some Slowdive romanticism into their MBV sonic stew, and that can only be a good thing. And if these reference points have no meaning or interest to you, then you’d best just move along. NYCTaper is sharing a recording of the band’s show in New York last week. Rot Gut, Domestic – the new album from Margot & The Nuclear So & So’s – is out March 20 and a new MP3 is available to download. They play The Garrison on April 5. NPR is streaming a complete Shins concert in New York last week while JAM and The Line Of Best Fit share interviews with James Mercer; their new record Port Of Morrow is out March 20 and they’re at The Molson Amphitheatre August 4.
eMusic talks to Bowerbirds. They play The Garrison on March 27. Le Blogotheque has posted a Take-Away Show with Perfume Genius; he plays The Drake Underground on April 8. Billboard and Rolling Stone talk to M. Ward about his new record A Wasteland Companion, due out April 10. J Tillman has released a new video from Fear Fun, his debut under the Father John Misty marque. It’s out May 1 and he is at The Horseshoe on May 14. Ramona Falls, aka the side-project of Menomena’s Brent Knopf, will release their second album Prophet on May 1 and follow it with a show at The Drake Underground on June 8. Hey, remember Garbage? They certainly hope so. They’ve got a new album called Not Your Kind Of People coming out May 15 and will be embarking on a short tour that ends at The Phoenix in Toronto on May 28. Class Clown Spots A UFO – the second album of the reunited Guided By Voices era is coming in June and the first sample is available to stream. It’s gorgeous. Details on the release and Bob Pollards new solo record – of course there’s another new Bob record – are available at Pitchfork. Pitchfork reports that Bob Mould has signed to Merge records for his next solo record, due out this Fall. Greg Dulli talks to Rolling Stone about rediscovering The Afghan Whigs – just in time for their reunion this year. Interview has an interview and NPR a World Cafe session with Sharon Van Etten. Billboard and Spinner talk to Jay Farrar about the New Multitudes Woody Guthrie project; the project also stopped in at Daytrotter for a session. Patterson Hood reflects on the making of Drive-By Truckers’ 2001 masterpiece Southern Rock Opera to Boulder Weekly.